What slows down and stops your bike? Your brakes? Nope…your tires tires stop your bike! What makes your bike turn? Leaning the bike and a bit of steering with the bars right? Well, actually it’s the contact patch of your tires on the trail surface that ultimately changes your bike’s direction. When it comes to MTB equipment, tires are extremely important. Yet they are pretty over looked by many riders. There are a lot of aspects of tires that need to be taken into consideration if you’re serious about getting it right; tire pressure; volume; casings,… but today we’re going to talk about tire tread and how it works with the surface of the trail. There are two ways in which your tires can get traction. 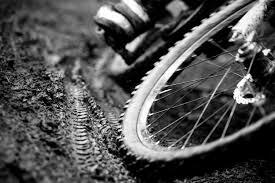 One, the rubber of the tire simply contacts the ground surface (like on pavement or a hard-packed trail), or two, the tread of the tires (or lugs or knobs) dig into the surface of the trail when it is soft (loose gravel, sand, mud, etc.). This is where different types of tread for different types of conditions come into play. But how does this work? First, imagine trying to stab a screwdriver into the grass on your front lawn. If the ground is fairly soft, the screwdriver will stab right in. Now, imagine trying to do the same thing with the end of a baseball bat. Probably isn’t going to happen right? The bat is too blunt and large to penetrate the surface. Lugs on tires work in a similar manner. A stiffer and thinner lug will stab into the soft, loose trail and “claw into” the ground while a shorter, fatter lug probably won’t, but instead will “float” on top of the surface (sometimes this is desirable—like with fat bikes in deep snow—but usually this simply means no traction and slipping and sliding around). Also, in order for the lugs to stab into the ground, there needs to be some space between the lugs, so the material can move out of the way as the lug stabs in. 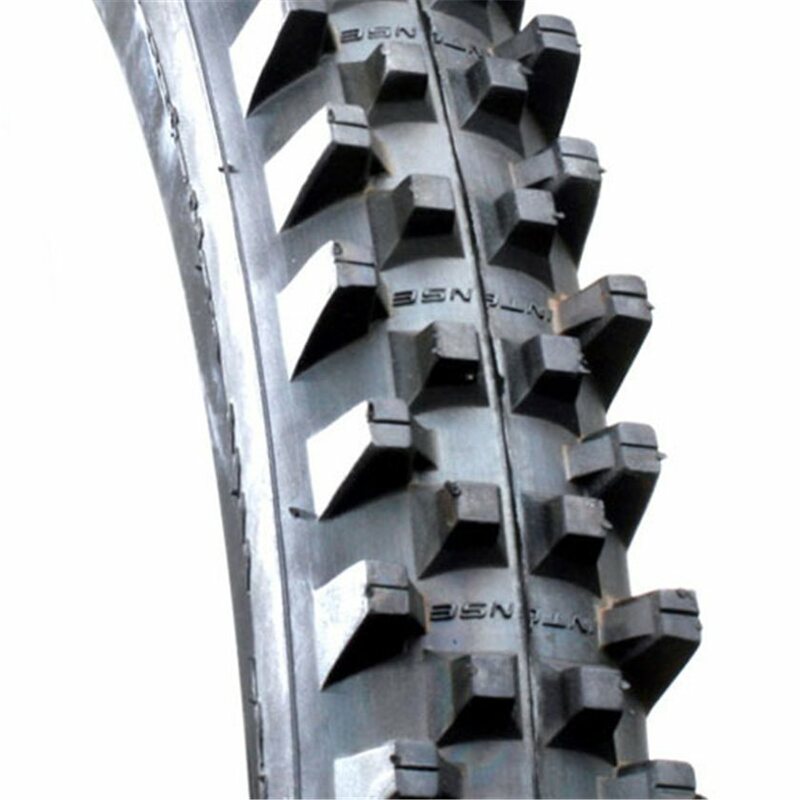 Mud tires, or spikes, are on the extreme side of a loose terrain tire. They have, literally, little rubber spikes for lugs. 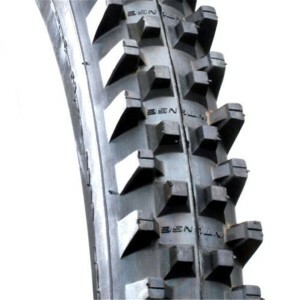 These lugs will stab and claw into the ground on loose surfaces and the adequate space between the lugs will allow the tire to “clear” mud and debris easily. The downside of tires that do a great job in the loose stuff? They can be fairly terrible on hard packed trail surfaces, rock, pavement, etc. Why? Because when the trail surface is hard and impenetrable, traction comes from contacting the rubber of the tire with the trail’s surface, not stabbing into it. Spikes and thin lugs that are designed for stabbing into loose terrain will provide very little surface area for contact on the hard surface. Also, the lugs are usually long and thin and will “roll over”, or bend, under the weight of the rider and bike. This means little to no traction. In the case of a hard trail surface—if you’re looking for traction—the more rubber that can touch the surface of the trail, the better. Tires for hard-packed surfaces are the types of tires that are sold on XC race bikes. These are the tires of choice for non-technical, smooth, fast, hard-packed surfaces. They will almost always be lower volume (volume is essentially the width and size of the tire), with light casings (how thick and tough the tire will be: light means fast, but also means thin and more susceptible to damage). These tires will have low profile (short) and tightly spaced lugs. The priority of these tires is usually very little rolling resistance and just enough tread to get a bit of traction when necessary. 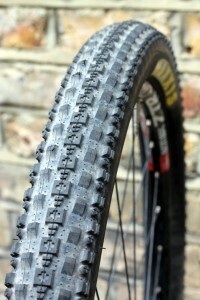 The pattern of the center lugs usually will provide a near constant contact with the trail’s surface. This allows the tire to move along with very little vibration or “buzz” and helps provide low rolling resistance. The downside? No ability to dig into loose terrain: the lugs aren’t large enough and are also too tightly spaced to allow the material to move out of the way. And, because of the lighter casings and lower volumes, these tires will have to be run at higher pressures to prevent flats, damaged rims, cut tires, etc. providing less ability for the tire to dampen bumps and conform to the trail for traction. These tires will be bad news in loose terrain: they will float and slide on gravel as if it were a bunch of marbles instead of being able to dig in and find purchase; because of their necessary higher pressures, they’ll deflect and bounce off of obstacles instead of absorbing them. Unfortunately, no tire is great—or even good—everywhere. What will work awesome in the blown out loose moon-dust and gravel of the Rocky Mountains will be slow, sluggish and sketchy on east coast hard-pack; what will have you smashing your buddies on those lung-busting fire road climbs could put you in the weeds on the way back down if you’re not careful! I usually use tires that work great in Colorado; large volume tires with large, well spaced lugs that move material and dig in, but also support and don’t roll over on off-camber rock. The problem is that they feel like they are filled with molasses when I’m back east coaching on fast, smooth trails. And, lighter, faster rolling tires, that fly on hard-packed trails east of the Mississippi can be somewhat of a death-wish back home in the gnarlier stuff. And, with today’s tubeless tire systems, it’s a hassle to swap out tires every week. What’s the answer? Aside form multiple wheel-sets mounted with different tires for different conditions (that’d be nice! ), there really isn’t an answer. Investigate, research, ride… I have a couple of different tire combos that I use and they differ at different time’s of the year. What’s your priority? Rolling resistance or traction? And, traction on what type of surface? Hopefully this article shedded a little light on the subject of tire tread and pointed a few of you in the right direction. In the DirtSmart Skills Camps, I have a bike set-up and equipment segment and we get way deep into tire choice, tire pressures, volumes, casings, etc.